But for some people, getting to Oundle Library has become impossible. Many customers living in villages have been badly affected by the withdrawal of local bus services; and there are many people who are housebound because of illness, disability or full-time caring responsibilities. And just because they can’t get to the library doesn’t mean they’ve stopped wanting to read. Step forward Oundle’s team of Home Library volunteers who, working singly or in pairs, drive around the villages every month delivering bags of books (and audio books) to people who can’t get to the library. Currently deliveries are made to 22 customers each month, in nine different villages, plus Oundle. It’s a reading lifeline! The Home Library service is free, and at Oundle Library is managed by Lesley Davidson. Every Home Library customer provides details of the sorts of books and authors they enjoy and, armed with this information, Lesley picks the books and fills the bags for delivery. It can be a challenge to get the selections right, but the rule-of-thumb is that it’s better to send too many books than too few. After all, part of the joy of visiting a library is choosing what to read, and people can always return what they don’t want. So, it’s hats off and a big thank you to all the volunteer drivers who deliver Oundle’s Home Library service: Stephanie Dudley, Sue Hales, Tony Hoyle, Jan Jerwood, David Lamburn, and Finola Stovin. They provide a Gold Star service and are worth their weight in gold! At the moment the villages visited for the Home Library service are: Brigstock, Clopton, Collyweston, Easton-on-the-Hill, Kings’ Cliffe, Nassington, Southwick, Woodnewton and Yarwell. 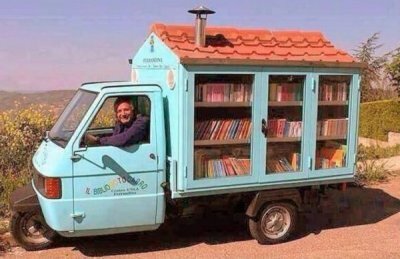 But these destinations are just where the library’s current housebound customers live, and it may be possible to add more villages to the list if needed. So, if you know someone who would like to use the Home Library service, just pop into Oundle Library and ask for more information.